If you lined up every bicycle ever built since the 1880s, the vast majority would look much like the one above. Easily 75%. It would probably be black, with three speeds, a chainguard and coaster brakes. Since the 1970s, bicycles designed for racing or touring or climbing hills have increased in popularity but when it comes to transport in cities and towns, nothing beats the upright bicycle. 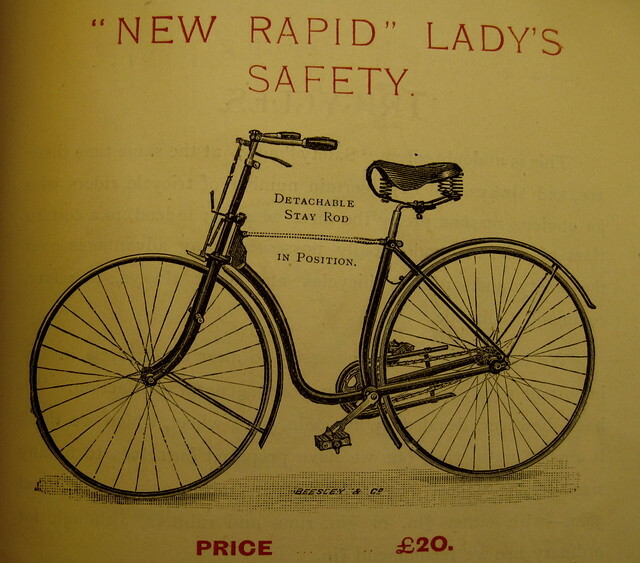 There are many reasons for why it became - by far - the most popular bicycle design in history. The simplest one is that it appeals to regular citizens and has been well-suited to urban life for over a century. For the purpose of this article, we're going to a festive dinner party. To explore, over cocktails, why upright bikes - the norm in mainstream bicycle cities like Amsterdam and Copenhagen - should be promoted more for city living. They have been sadly neglected for many years by a rather singular focus on cycling for sports or recreation. Now, however, bicycles are back as transport and bikes for the 99% are an important aspect of growing cycling levels. Brent Toderian and Chris Brunlett tackled this subject well in their recent joint article - In Praise of the Upright Bike. Sitting up straight, like your mother taught you, can easily apply to transport and has distinct safety benefits. In an upright position, your centre of gravity is in much the same spot as it is when you are walking. Homo sapiens have been around for about 200,000 years and prior to that, other upright-walking species spent around 2 million years evolving this all-important centre of gravity to near-perfection. Our centre of gravity is quite handy in helping us get around. It is something that we use every single day in almost every move we make. We're quite good at it. In fact, science seems to indicate that sitting up straight is good for you. A quick glance at the people on the bicycles in the montage, above, and you see that little distinguishes the cyclists from pedestrians. All the centres of gravity are pretty much the same. 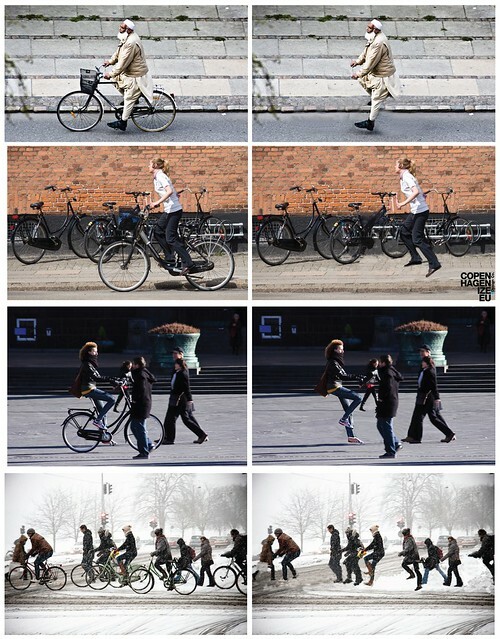 Remove the bicycles with questionable photoshop skills and very little changes, apart from oddly bent knees. Compare this to the riding position on, for example, racing bikes. The upper body is pitched forward, which causes the centre of gravity to shift. In this position the point is dangling in mid-air somewhere over the crossbar. Just think about braking sharply. Your body must battle to keep the weight of your upper body from chucking you forward, which is unnatural for homo sapiens. In an upright position, your body knows how to re-adjust itself for this sudden stopping motion, much like when you stop suddenly when walking or jogging. The racing position is great for people who... well... race or who like to go fast. Works perfectly for them, which is super. 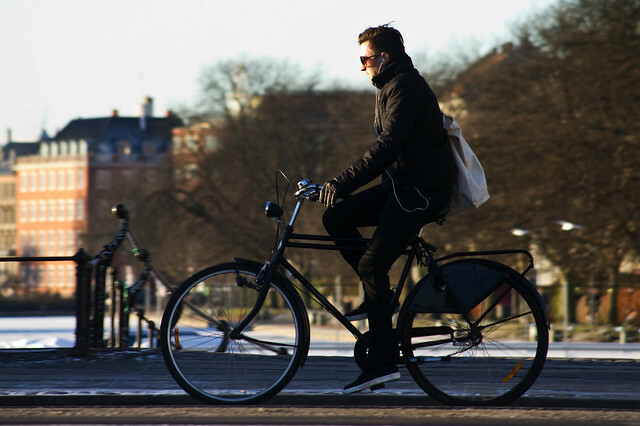 If you look at mainstream bicycle cities, the majority of people don't wish to adhere to this way of riding, prefering to merely use the bicycle as a quick and easy tool for getting around. 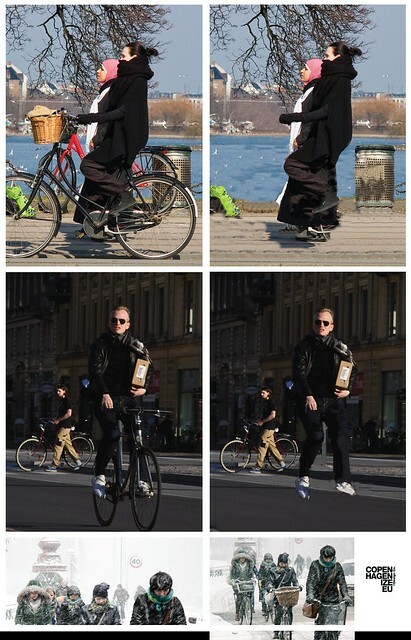 Acceleration on upright bicycles is also much easier, simply because your centre of gravity remains, largely, the same. You just stand up and assume even more of a walking posture - or at least leaning forward as you would when running - pulling on the handlebars as opposed to pushing down on them. As the young woman illustrates. Much the same physics applies to the simple but important task of keeping an eye on what's around you, including traffic. Walking down the street and turning your head to see if the bus is coming is not far removed from sitting upright on a bicycle and turning your head to perform a shoulder check. Your balance is stable. Try sitting at a table and lean over it, as though you were on a racing bicycle. Then try to perform a shoulder check. Odds are you'll be mostly checking your shoulder, as opposed to the traffic. If you want to get a clearer view, you'll have to shift your centre of gravity to the side. Rather unnatural for humans, not to mention unstable. Sure, you could look under your arm, like racing cyclists do, but then you're removing your vision almost completely from what's ahead of you. Not advisable. While you're at the table, leaning over, try looking straight ahead. Your neck is not in a comfortable position the way you have to keep it lifted up. This isn't a problem you'll have when you're sitting up straight. 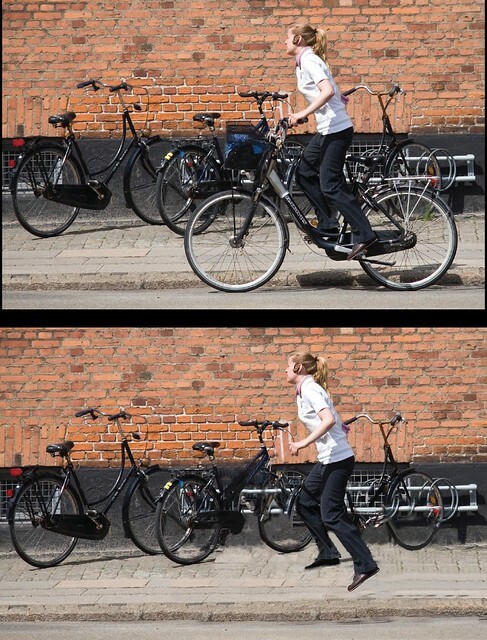 Besides the safety aspects of the upright bicycle, the design encourages you to have a look around your city when you ride, instead of speeding off. You'll notice more on your daily ride and, indirectly, contribute to strengthening the weave in the urban fabric. An increased sense of community is not a bad added value. Interesting, the rapid growth in sales of bicycles that feature "Easy Boarding", or a frame that makes it even easier to get on or off the bicycle, is an indication that the upright bicycle is experiencing yet another renaissance. Originally designed for the elderly, these easy boarding models are quickly going mainstream, thanks to their ultra low frame. When you do it right, your city's cyclists are indistinguishable from pedestrians. A little taller, perhaps, a little quicker as they pass, but that's about it. If we are to grow cycling in cities, we need infrastructure, of course. But we also need societal mirrors held up for citizens. Seeing only sub-cultures whizzing about and sticking out like a sore thumb in their "uniforms" does little to encourage regular citizens to choose a bike for transport. 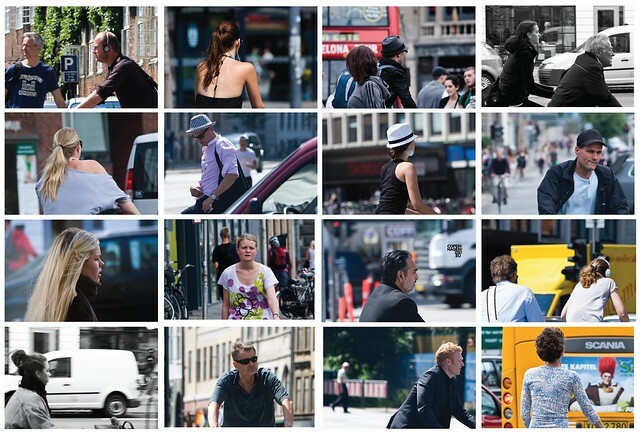 Seeing people looking just like you, however, changes the perception of cycling in cities. It creates a springboard for people to leap elegantly into new transport habits. Habits that improve the quality of life in cities, keep people healthier and tighten the weave on the urban fabric.